As a new parent, you do not initially realize just how important the concept of time is to the proper development of your child. Not only does time dictate feeding times and nap times, it will also let you know that, no matter what your son says, he has indeed been swinging on the monkey bars for 17 minutes straight. That's why having a great watch is so important. As a man, I know that the natural inclination is to gravitate towards the chunky watches with 32 dials, 14 time zones, and a laser beam. While these achievements of chronological magnificence are, I'm sure, useful in certain situations, the harsh reality is that I am neither (a) a deep-sea diver nor (b) a secret agent. Therefore, my personal choice in recent years has been the Tank watch. To be specific, the "Tank" is actually the name of the style of watch created by the famous French watchmaker Louis Cartier in 1917. The Cartier Tank, a watch inspired by the rectangular lines and precise proportions of the Allied Forces' tanks in World War I, was eventually perfected in 1919. As a matter of fact, the steel band edition of the watch was designed to resemble the caterpillar tracks of its armored muse. Now, obviously, although the Cartier version of the watch is gorgeous, I am in no position to pay close to $5,000 for a watch. 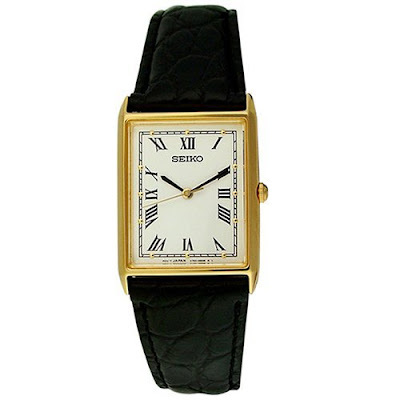 However, the tank style is produced by multiple watch manufacturers and is available in a wide range of prices. The watch is subtle, graceful and classic and makes the difficult transition from "play-date outfit" to "formal evening wear" with ease. I wear mine, literally, every single day. As a parent, I understand that there are more pressing responsibilities than personal style; things like rent, food, and body wash. However, I do not subscribe to the belief that responsible parenting should happen at the expense of fashionable appearance. To me, the easiest solution is to find affordable, classic pieces that will endure both the test of time as well as withstand multiple hits from your son's toy hammer. A watch inspired by an armored tank passes both of these tests triumphantly.